Winston Churchill once said “We shape our buildings; thereafter they shape us.” British photographer Jon Kempner builds on that concept in his body of photographic work, crafting images that allow us to experience some of the world’s most unique architecture from afar. Kempner describes his work as “architectural portraiture”, and he uses space and decor to develop captivating images that draw you in. He has over 20 years of commercial photography, and has traveled all over the world for clients. His photographs appear in various magazines, newspapers, and advertising. Jon kindly took some time to answer our questions, and we’re honored to share his insights and work with you! Tell us a bit about yourself and your photography. Can you give us a quick rundown of who you are, what you do, and what your specialty is? I have run two small businesses for over 20 years, One is a small design consultancy that is primarily focused in the business-to-business sector and the other is my commercial photography business, which specializes in architecture and interiors photography. I recently found some old family Kodachrome slides including one of me aged 7 or 8 with a camera in hand, so I guess that’s when my interest in photography was born. I still have a few prints of my early photos including some old, informal school photos, which were of great interest, and much amusement at a school reunion a little while ago. I studied design at college and my commercial photography interest started when I was involved in a commercial photo shoot working as one of the design team on a new range of office furniture. The sets were huge, with lots of complex lighting and the busy, creative environment really inspired me. In those “film” days there was no room for error, so metering and lighting were essential skills to learn and master and these have played a key role in developing my professional knowledge and skill set over the years. I spent quite a few years working with my design clients creating and producing photography for advertising and brochures. I have a keen interest in architecture and I was thrilled to get a commission to photograph some contemporary, commercial properties for an architectural glazing systems client. Their buildings were huge and the shoots were a little out of my comfort zone – but I’ve always found that was a great way to drive yourself and your business forward. I’m pleased to say that it was a success and I used those shots in my portfolio for years, helping me establish my credentials as an architectural and interior specialist. As photographers I believe that we’re all early adopters of technology. I established a website presence quite some time ago, but over the past few years and with the growth of mobile, my website has become one of the most crucial tools of my business. Whilst my existing clients browse it from time to time to see my new work, I know that new, prospective clients view it to look at my photographic style and get a feel for the types of buildings and interiors that I shoot and the way I shoot them. Although I use my website primarily as a portfolio and news site, I am also aware that it forms an essential part of my brand, giving visitors an insight into my work and my personality. I still advocate that personal contact and personal recommendation are key to developing my business. My website acts as both a credentials check and competency guide to new clients, showing them my photographic style and giving them an indication of what I will achieve for them. For some of my new business marketing campaigns I will often set up a specific landing page to direct prospects into my portfolio (and to track response) – and this is really easy to set up within the theme. In terms of value, my website is immeasurable. It would be almost impossible to survive commercially without it. There’s a lot of competition out there and keeping things fresh, up-to-date and visually appealing is critical. How did you chose your template and why did you settle with Albedo? When I redesigned my website I knew I would use WordPress as the architecture. I looked around for ages to find a suitable theme that held a balance between visual content, impact, and a professional, commercial feel. When I found Graph Paper Press I was spoilt for choice. 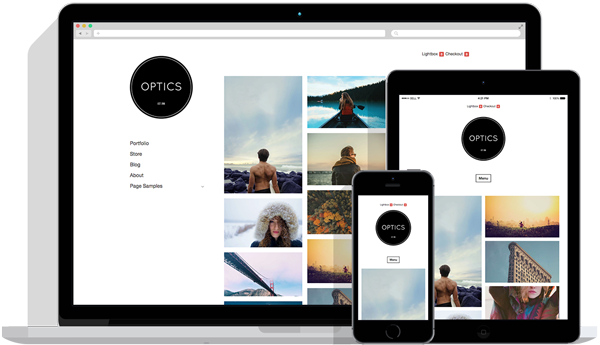 The templates are well designed for those in the creative industry with many of them geared specifically to photographers. I wanted a theme that would be quick and straightforward to get my new site up and running and not over-complex or too technical to manage. Graph Paper Press’ templates were able to deliver on all counts for me. Are you using Sell Media? I’m not using Sell Media at the moment, but I am currently working through my archive of photos to create a small library of specialist architectural and interior images. Once I have the content ready I will be adding Sell Media to my site as I feel it gives me the independent control of the usage and price of my stock. Have you ever reached out to Graph Paper Press? When I was building my site, there were a couple of small issues that I came across. Reading up on the online support pages solved one issue easily and the other was resolved quickly by email response from the GPP technical team. Are you working on any passion projects right now? I really love old “heritage” buildings and I have been working with a client over the past 15 years documenting their 18th Century house as they restore it back to it’s original glory. It’s still used as their home and it also has magnificent gardens. I would love the opportunity of working with more historical, listed, and heritage buildings in the future. I have also started to produce some moving image/video work and I am hoping to push this further over the next few months. Thanks for talking with us! One more question. If you could only carry one piece of equipment with you for an entire year, what would it be and why? Definitely my Canon EOS 5DS with my Tilt/Shift-24mm lens. The massive 50.6MP images are exceptional and the quality of the glass on the tilt/shift lens is equally impressive. For an architectural and interiors photographer it’s an essential piece of kit. You can see more of Kempner’s work on his website: www.jonkempner.com. Follow him on Twitter and Facebook, and check out some more awesome photos on his Instagram! This entry was posted in Blog and tagged featured user, interview, Jon Kempner, Photographer. Bookmark the permalink.